NCHM JEE 2015 Important Dates: The exam conducting authority National Council of Hotel Management and Catering Technology decides all important events and activities of the national level hotel management entrance examination NCHM JEE 2015. The exam will be conducted on April 25, 2015 in paper-pencil format. The application form for NCHM JEE 2015 is out and the last date for submission is April 6, 2015. For end to end expert guidance of NCHMCT JEE and other Hotel management exams Click Here. 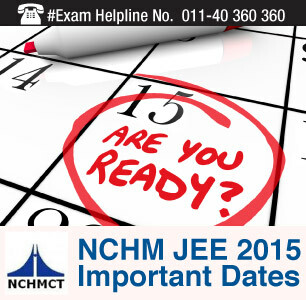 Careers360 here brings a list of NCHM JEE 2015 Important Dates based on the information brochure of last year. All important events are expected to follow the schedule of the last year NCHM JEE activities. The list mentions the tentative schedule of all NCHM JEE 2015 Important Dates and events such as start and last date date for download of application form, availability of admit card, result date. The NCHM JEE 2015 Important Dates of important events and activities are expected to be in line with the exam events of the last year.